American Suzuki "Free Gas for Summer" sales promotion offers car buyers three months of free gasoline on retail purchases of any new 2010 Suzuki model, including the all-new Kizashi (above), SX4 SportBack, SX4 Sport sedan, SX4 Crossover, Grand Vitara and Equator. The Suzuki "Free Gas for Summer" sales program kicks off May 1 and runs through Aug. 31. Customers will receive a stored value debit card, ranging in value from $280 to $442, which can be used for fuel purchases. The amount of each stored value gas card is determined by several factors, including an assumed three-month timeframe for summer driving, the car's EPA estimated highway mpg, the Federal Highway Administration's estimated average of 1,000 miles driven per month and the U.S. national average price of one gallon of regular gasoline as determined by the U.S. Energy Information Administration. 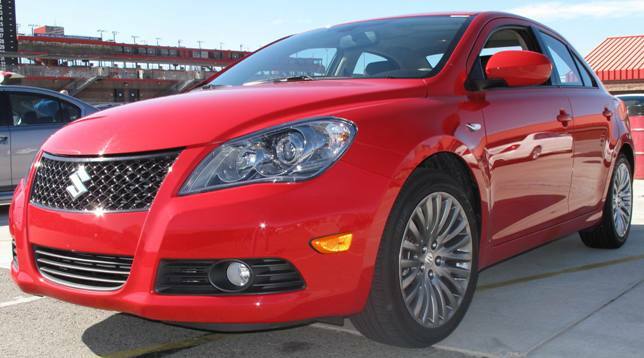 The 2011 Kizashi Sport, shown in New York International a month ago, is offered on Kizashi GTS and SLS trim levels and goes on sale in the United States this August. Pricing will be announced closer to the vehicle's arrival in dealer showrooms. Features include a more muscular front fascia with chrome accents and lower grille, body side sill extensions, lower body side molding with chrome accents, a trunk mounted spoiler, custom light weight 18-inch alloy wheels and a 10mm lower ride height. American Suzuki sales in March were a dismal 2,246, a 72 percent tumble from March 2009 and year-to-date sales through March are 5,661, a 63 percent drop from 2009. We'll find out Monday how the month of April treated Suzuki sales in the U.S. and we'll see how the just-announced free gas for summer promotion and the Sport version of the Kizashi will help move metal. The all-new 2010 9-5 Saab top-of-the-line Aero Sedan, arriving in U.S. dealer showrooms in July, will be priced at $49,990 MSRP. The Aero will have a 300 horsepower 2.8-litre V6 turbo engine with dual overhead camshaft valvetrain and a twin-scroll intercooled turbocharger mated to the Sentronic six-speed automatic with transmission with paddle shifting. Then it will be shortly followed by the 9-5 Aero introduction with a 2.0-litre turbo variant. Pricing for these 2011 model year vehicles will start at under $40,000 MSRP. 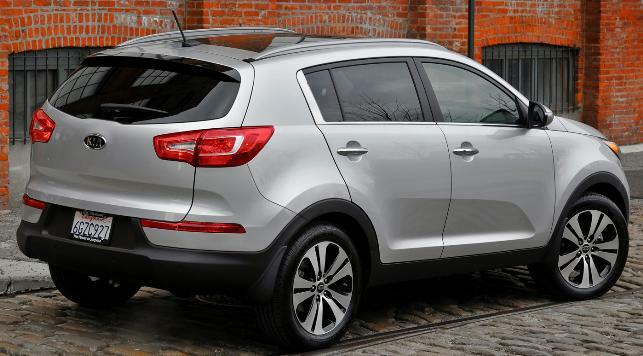 The all-new 2011 Kia Sportage compact CUV, drawing from the styling elements of the Kue concept, is longer, wider and lower than the previous model and displays the new face of Kia, or the “Schreyer” line, coming from its designer Peter Schreyer who joined Kia almost 4 years ago after a long career at VW/Audi where he was famous for his A6 and TT designs. 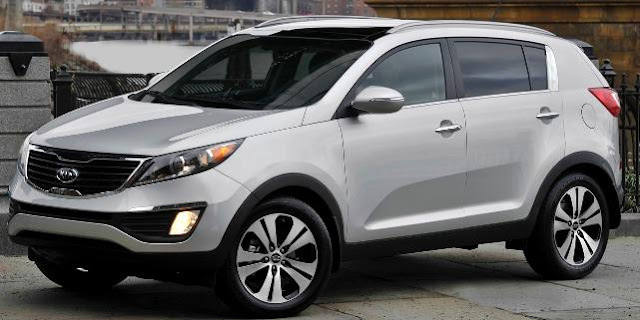 The 2011 Sportage, on an all-new platform, has an overall length of 174.8 inches, overall width of 73 inches, wheelbase of 104 inches, and utilizes independent front-and-rear suspension systems. The all-new Sportage comes standard with a 176 horsepower 2.4-liter DOHC 16-value four-cylinder engine with Continuously Variable Value Timing. A more powerful fuel efficient 2.0 liter Gas Direct Injected turbo powerplant will be available in the 2011 model year. Offered with two-wheel or all-wheel drive configurations paired to either a six-speed manual transmission (base) or a six-speed automatic transmission, Sportage is available in two trims, LX and EX. Sportage EX models have available features, including leather-trimmed seats, heated and ventilated front seats, push button start, rear sonar detector and a panoramic sunroof. The 2011 Sportage will be the second Kia model to offer UVO powered by Microsoft®3, the hands-free in-car communication and entertainment system (standard on EX models) enabling drivers and passengers to answer and place phone calls, receive and respond to SMS text messages, access music from a variety of media sources and create custom music experiences. Consumer Reports has judged the 2010 Lexus GX 460 SUV a Don’t Buy: Safety Risk because of a problem we experienced during our standard emergency-handling tests. When pushed to its limits on our track’s handling course, the rear of the GX we bought slid out until the vehicle was almost sideways before the electronic stability control system was able to regain control. We believe that in real-world driving, that situation could lead to a rollover accident, which could cause serious injury or death. We are not aware, however, of any such reports. All four of our auto engineers who conduct the test experienced the problem in an exercise used to evaluate what’s called lift-off oversteer. In the test, as the vehicle is driven through a turn, the driver quickly lifts his foot off the accelerator pedal to see how the vehicle reacts. We perform this evaluation on every vehicle we test, which includes the 95 SUVs in our current auto Ratings. No other SUV in recent years slid out as far as the GX 460, including the Toyota 4Runner, which shares the same platform as the GX. To confirm our results, we paid for the use of another GX 460 from Lexus and experienced the same problem. In real-world driving, lift-off oversteer could occur when a driver enters a highway’s exit ramp or drives through a sweeping turn and encounters an unexpected obstacle or suddenly finds that the turn is too tight for the vehicle’s speed. A natural impulse is to quickly lift off the accelerator pedal. If that were to happen in the GX, the rear could slide around far enough that a wheel could strike a curb or slide off the pavement. Either of those scenarios can cause a vehicle to roll over. And because the GX is a tall SUV with a high center of gravity, our concern for rollover safety is heightened. Like almost all current SUVs, the GX has standard ESC. That system is designed to prevent a vehicle from sliding out in a turn and has generally worked very effectively in the vehicles we’ve tested. It does that by applying individual brakes and cutting engine power to help keep the vehicle on its intended path. But the GX’s system doesn’t intervene quickly enough to stop the slide, and the rear end swings around too far. As a result, we are urging consumers not to buy the GX 460 until the problem has been fixed. The GX 460 has been on sale for about three months and about 5,000 vehicles have been sold. We have notified Toyota, Lexus’ parent company, of the problem. We urge the company to develop a remedy as quickly as possible and implement it in new vehicles produced at the assembly plant and those already purchased. We have also informed the National Highway Traffic Safety Administration. The designation is rare for Consumer Reports; the last time we judged a vehicle’s performance not acceptable was with the 2001 Mitsubishi Montero Limited in the August 2001 issue of Consumer Reports magazine. Current GX 460 owners: If you own a 2010 Lexus GX 460, we recommend exercising care when exiting the highway or traveling twisty roads. Obeying the speed limit and being alert for potential road hazards should limit the risk of experiencing a problem, like that recorded at the test track. We hope that Toyota can quickly develop a software update for the stability control system and update current models with revised programming. "For more than 20 years, Lexus has made customer safety and satisfaction our highest priorities. We are taking the situation with the GX 460 very seriously and are determined to identify and correct the issue Consumer Reports identified. 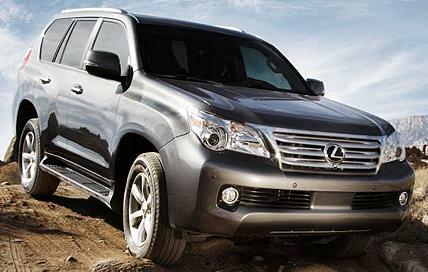 At this time we have asked our dealers to temporarily suspend sales of the 2010 GX 460. Lexus' extensive vehicle testing provides a good indication of how our vehicles perform and we are confident that the GX meets our high safety standards. Our engineering teams are vigorously testing the GX using Consumer Reports' specific parameters to identify how we can make the GX's performance even better. For any customer who has purchased a 2010 GX 460 and is concerned about driving their vehicle, we will provide a loaner car until a remedy is available. The all-new 2011 Acura TSX Sport Wagon with a 2.4-liter, DOHC i-VTEC®, inline four-cylinder engine made its world debut at the New York International Auto Show. The TSX Sport Wagon delivers an EPA-estimated 30 mpg on the highway and features technologies including an available hard disk drive-based Acura Navigation System™ with an all-new 8-inch full VGA high-resolution color display and AcuraLink Real-Time Traffic and Weather™ featuring radar image mapping. The TSX Sport Wagon will be available with an Acura/ELS Surround® Premium Audio System and a hard disk drive (HDD) for media storage. Additionally, the TSX Sport Wagon is equipped with standard features, including a power glass moonroof, dual-zone automatic climate control, leather seats, a premium sound system, Bluetooth® HandsFreeLink®, and USB port and AUX jack music interface. The TSX Sport Wagon will come with standard safety features, including Acura's Advanced Compatibility Engineering™ body structure. The 2011 TSX Sport Wagon arrives at Acura dealerships in the late Fall. Mitsubishi Outlander Sport, an all-new crossover utility vehicle, joins the Outlander family lineup with a 148 horsepower MIVEC-equipped 2.0-liter four-cylinder engine giving an estimated highway fuel economy in the 31mpg range with a price tag under $19,000. The Outlander Sport features standard technologies such as Active Stability Control (ASC), Hill Start Assist (HSA), Electric Power Steering (EPS), a comprehensive seven-airbag safety system, and a high-contrast LCD instrument display. Also available is a LED-accented Panoramic Glass Roof, 710W nine-speaker Rockford Fosgate audio system and FUSE Hands-free Link system. Two trims will be offered in the U.S. market for 2010: the ES with a standard 5-speed manual transmission or the premium SE with a standard sportronic ™ 6-speed CVT with magnesium-alloy paddle shifters. SE models include a number of convenience features such as standard automatic climate control, rain-sensing windshield wipers and the keyless FAST-key passive entry system with push-button, One-Touch Start/Stop (OSS). Also available on SE models, the optional 40GB hard disk drive navigation system provides accurate mapping and lifetime real-time traffic updates with its 7-inch LCD display and doubles as a music server. The optional Rockford Fosgate in-car entertainment system has a full 710 watts of power and nine speakers for greater sound detail and quality. Expect to see the Outlander Sport in U.S. showrooms this Fall. Hyundai's all-new flagship 2011 Equus, like its Genesis sibling, is built on Hyundai's rear-wheel-drive architecture and powered by the 4.6-liter Tau® V8 engine producing an estimated 385 horsepower using premium fuel and 378 horsepower using regular fuel and mated to a ZF 6-speed automatic transmission with SHIFTRONIC® manual control. Equus is 7.2 inches longer (203.1 inches vs. 195.9 inches) than Genesis. At the New York Show, Hyundai announced such features as an iPad owners manual in the glove box, a service department that comes to you and pampering optional features including passenger massage seats. Equus will also have technology including a lane departure warning system, electronic air suspension, smart cruise control and a Lexicon® audio system. Equus' total of nine airbags include advanced dual front airbags, front and rear seat-mounted side-impact airbags, roof-mounted side curtain airbags for both front and rear outboard seat occupants and a driver's knee airbag. Equus has an optional camera located on the front grille and a standard camera on the rear decklid delivering a picture to an in-dash LCD monitor to help detect how close objects are when parking. The Equus will launch with a starting price in the mid $50,000 range. Hyundai debuted its 274 horsepower 2.0-liter Theta II turbocharged gasoline direct-injection four-cylinder engine with an estimated 22 mpg city and 34 mpg highway rating for the 2011 Sonata at the New York Auto Show. Hyundai also unveiled its 209 horsepower 2011 Sonata Hybrid delivering electric-vehicle operation at steady-state speeds of up to 62 miles per hour - that's double most hybrids on the road today! I can't wait to test it. The Hyundai-developed Hybrid Blue Drive architecture, using lithium polymer battery technology, is a full parallel hybrid drive system, which can operate on an electric motor, gasoline internal combustion engine, and a combination of the two depending on driving conditions and driver demands. Sonata Hybrid’s projected highway fuel economy is 39 mpg and city fuel economy of 37 mpg. 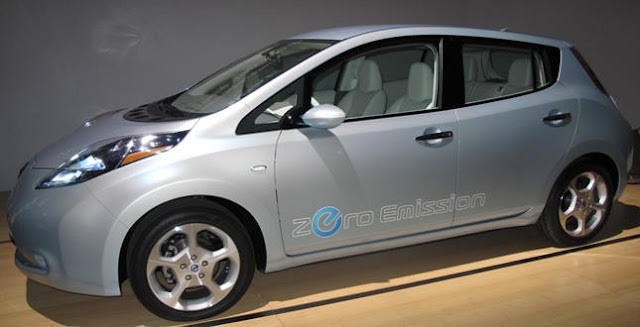 The 2011 Nissan LEAF electric vehicle will have a Manufacturer's Suggested Retail Price (MSRP) of $32,780, which includes three years of roadside assistance. Including the $7,500 federal tax credit for which the Nissan LEAF will be fully eligible, the consumer's after-tax net value of the vehicle will be $25,280. Additionally, Nissan says there is an array of state and local incentives that may further defray the costs and increase the benefits of owning and charging a Nissan LEAF such as a $5,000 statewide tax rebate in California; a $5,000 tax credit in Georgia; a $1,500 tax credit in Oregon; and carpool-lane access in some states, including California. As a result Nissan will be able to offer a monthly lease payment beginning at $349, not including state or local incentives, which could further reduce the net cost of the Nissan LEAF. The SL trim level, available for an additional $940 (MSRP), adds features including rearview monitor, solar panel spoiler, fog lights, and automatic headlights. Nissan will offer personal charging docks, which operate on a 220-volt supply, as well as their installation for an average cost of $2,200 which Nissan says is eligible for a 50 percent federal tax credit up to $2,000. Nissan is providing these home-charging stations, which will be built and installed by AeroVironment, as part of a one-stop-shop process that includes a home assessment. Using current national electricity averages, Nissan LEAF will cost less than $3 to "fill up." The new 2011 Lincoln MKZ Hybrid, Lincoln's first hybrid, uses a the 2.5-liter Atkinson-cycle I-4 hybrid engine, Ford's second-generation hybrid technology. The new 2011 Lincoln MKZ Hybrid is expected to deliver at least 41 miles per gallon in the city when it goes on sale this Fall. Lincoln says Lincoln MKZ Hybrid's projected fuel economy tops its nearest competitor, the 2010 Lexus HS 250h, by 6 mpg. The combined gasoline engine and electric motor provide 191 net horsepower. Plus, the pure electric mode on the Lincoln MKZ Hybrid extends to 47 mph compared with the Lexus HS 250h battery-only mode which reaches just 25 mph.The 2011 Lincoln MKZ Hybrid uses a the 2.5-liter Atkinson-cycle I-4 hybrid engine, Ford's second-generation hybrid technology. The 2011 Lincoln MKZ Hybrid comes standard with features and technologies like the SmartGauge with EcoGuide, Ford's interactive technology providing real-time information on efficiency and driving performance, Lincoln SYNC, a voice-activated communications and entertainment system, and MyKey which allows parents to program a key to limit speed and audio volume to encourage teens to drive safer and improve fuel efficiency. Also, Ford and Microsoft announced Microsoft Hohm™, an energy management application for Ford’s electric vehicles that will help owners determine when and how to most efficiently and affordably recharge battery electric (BEV) and plug-in hybrid (PHEV) vehicles. It also should help utility companies manage the added demands of electric vehicles on the electric grid.make electric vehicle ownership easier and more affordable for consumers. 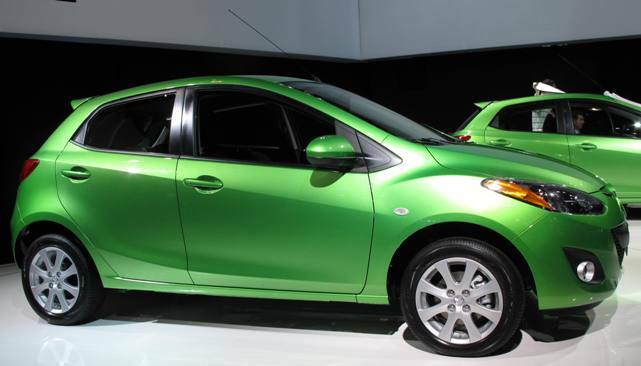 The all-new 2011 MAZDA2, powered by a 100 horsepower 1.5-liter four-cylinder engine, will have a starting manufacturer's suggested retail price (MSRP) of $14,730, including destination charges of $750 when it arrives in U.S. showrooms in July. The 2011 MAZDA2 is available in two trim levels – the entry level Sport will have either a five-speed manual or four-speed automatic transmission and the Touring which has a starting price of $16,185, is equipped with a five-speed manual transmission or available four-speed automatic transmission. Standard features include Anti-lock Braking System (ABS), Dynamic Stability Control (DSC) with Traction Control System (TCS), Electric Power Assist (EPAS) steering system, 185/55/R15 all-weather tires mounted on 15-inch steel wheels with full wheel covers, body-colored door handles and power mirrors, air conditioning, power windows and door locks, AM/FM/CD/MP3 stereo with four speakers, audio auxiliary jack, tilt steering wheel, remote keyless entry system, rear window wiper/washer and 60/40 split fold-down rear seats. All Touring models feature upgraded cloth seat fabric with red piping, 15-inch alloy wheels, fog lights, rear roof spoiler, chrome exhaust tip, leather-wrapped steering wheel-mounted audio and cruise controls, trip computer and a six-speaker AM/FM/CD/MP3 stereo system. Mazda plans to launch its all-new SKY Concept powertrains into the U.S. market, beginning as early as 2011. The Mazda SKY-G, Mazda's next-generation gasoline engine, will be the core powertrain in future Mazda vehicles. SKY-G is expected to boost fuel efficiency by approximately 15 percent while also increasing engine power. Mazda plans to put its SKY-D engine into its next-generation mid-sized diesel car, achieving highway fuel economy of up to 43 miles per gallon, a 20-percent improvement in fuel efficiency over Mazda's current 2.2-liter diesel. 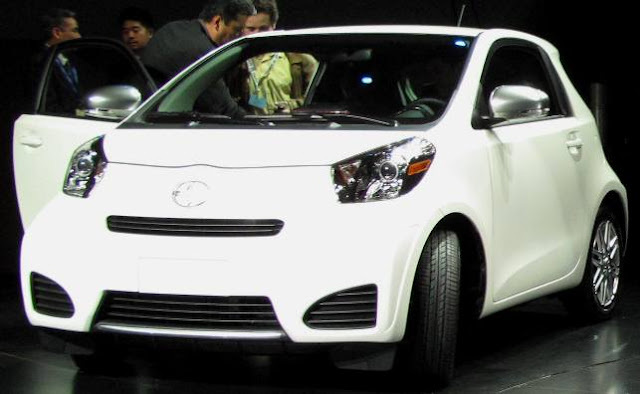 The all-new 2011 Scion iQ, equipped with a 90 horsepower 1.3-liter, four-cylinder engine, was touted as MINI-er and smart-er at the New York Auto Show which clearly defines its target competitors. The iQ has a 78.7-inch wheelbase, overall length of 120.1-inches and width of 66.1-inches. The iQ will come standard with 10 SRS airbags, including the world's first rear-window curtain airbag. The iQ comes standard with a six-speaker audio system, USB and auxiliary ports. The 2011 iQ will go on sale in early 2011. 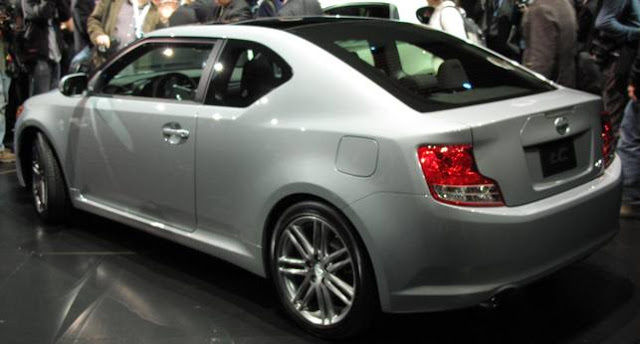 Six years after its launch, the second-generation Scion tC sports coupe emerges on a new platform with an all-new 2.5-liter inline four-cylinder engine with dual VVT-i that generates 180 horsepower, 19 more than the previous model, and 11 additional lbs.-ft of torque. The tC features two all-new transmissions, a six-speed manual transmission and a new six-speed automatic which gains two gears along with sequential-shift. 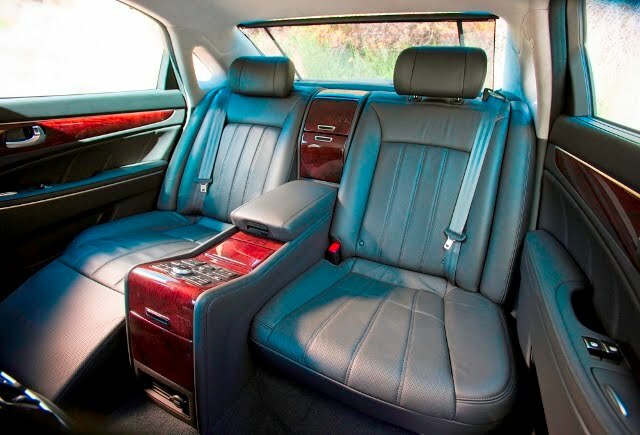 Overall, the cabin has been lengthened and reclining rear seats that split 60/40, provide more storage capacity. The panoramic moonroof remains standard in the new tC. The new tC comes standard with an AM/FM/CD/USB audio system that features eight speakers and, as with all Scion models, steering-wheel-mounted controls allow the driver to easily navigate through all of their music. The tC is scheduled to arrive in dealerships later this Fall. The all-new Nissan JUKE sports cross is built on the Versa platform and looks like a smaller version of the Rogue crossover. JUKE is powered by a 180+ horsepower 16-valve DOHC aluminum-alloy 1.6-liter inline 4-cylinder Direct Injection Gasoline turbo engine delivering 170+ lb-ft of torque. The JUKE will be offered with both front wheel drive and a torque vectoring all-wheel drive system. The two transmissions offered are Nissan’s Xtronic Continuously Variable Transmission with S-Mode and a 6-speed manual transmission on the SV FWD and SL FWD models only. Nissan says that JUKE is expected to start at just under $20,000 when it arrives in showrooms this Fall. The all-new 2011 Infiniti QX Luxury Sport Utility Vehicle has a new 400 horsepower 5.6-liter V8 engine with Infiniti’s VVEL (Variable Valve Event & Lift) and Direct Injection Gasoline technologies producing 25% more power and more than a 10% increase in fuel efficiency versus the previous design. A new standard 7-speed automatic transmission with manual shift mode and Downshift Rev Matching replaces the previous 5-speed automatic. Features include Standard Around View™ Monitor, upgraded Bose® Premium Audio System, Automatic Temperature Control System. In addition, the new QX offers a new Hydraulic Body Motion Control system, a Theater Package with dual 7-inch monitors, Advanced Climate Control System, Lane Departure Warning , Lane Departure Prevention and new Blind Spot Warning. The 2011 Infiniti QX will start at a Manufacturer's Suggested Retail Price (MSRP) of $56,700 for the QX56 2WD and $59,800 for the QX56 4WD, excluding applicable tax, title, license and Destination & Handling fees which is the same pricing as the previous generation QX. The 2011 QX is scheduled to go on sale at Infiniti retailers nationwide in early summer 2010. Subaru introduced the new 2011 4-door Impreza WRX STI to join its 5-door performance flagship model with revised suspension tuning and lighter 18-inch wheels. The WRX STI has a high-boost 305 horsepower turbocharged/intercooled 4-cylinder boxer engine mated to a 6-speed manual transmission with the Multi-Mode Driver Controlled Center Differential version of Symmetrical All-Wheel Drive with three "Auto" modes, as well as a manual mode with six driver-selectable differential locking settings. The 4-door WRX STI has a newly designed front grille with black base, wider rear fenders, lowered ride height and the Brembo Performance Brake System which uses ventilated 4-wheel Super Sport anti-lock disc brakes with Electronic Brake-force Distribution. The 2011 Subaru Impreza WRX STI models arrive in Subaru dealerships late this summer. The all-new all-wheel drive 2011 Volvo S60 sport sedan, another highlight from the New York Auto Show, comes with a 300 horsepower in-line 3.0-liter six-cylinder turbocharged engine delivering 325 lb-ft of torque and mated to a six-speed "Geartronic" automatic transmission. 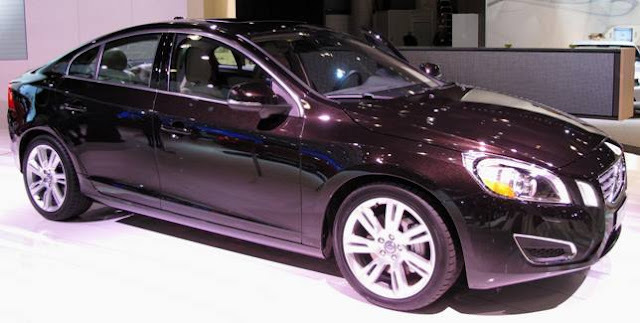 The 2011 Volvo S60 will have Pedestrian Detection with Full Auto Brake that actively helps the driver avoid accidents. Volvo’s radar- and camera-based system can detect pedestrians in front of the car, warn the driver if anyone walks out into its path – and then automatically activate the S60’s full braking power if the driver fails to respond in time. Pedestrian Detection with Full Auto Brake consists of a newly developed radar unit integrated into the all-new S60’s grille, a camera fitted in front of the inside rearview mirror and a central control unit. The radar’s task is to detect any object in front of the car and to determine the distance to it while the camera determines what type of object it is. The Volvo S60 will arrive at dealerships later this Fall. The Volkswagen Touareg and Porsche Cayenne, built together with the Audi Q7, had their latest incarnations introduced at almost the same time this week at the New York International Auto Show. The new VW Touareg whose first generation model came out in 2004, is wider, lower, longer with more interior room and nearly 450 pounds lighter than the previous one. The Touareg will have three available engines: A V6 FSI® gasoline engine, a V6 TDI® Clean Diesel engine, and a V6 TSI® gasoline hybrid engine. With the Touareg Hybrid model, a 3.0-liter supercharged, direct injection V6 gasoline engine is paired with a electric motor that reduces fuel consumption and CO2 emissions by about 40 percent. The V6 engine and electric motor combined produce a total of 375 horsepower and 428 lbs.-ft. of torque allowing for full towing capacity of up to 7,700 pounds. 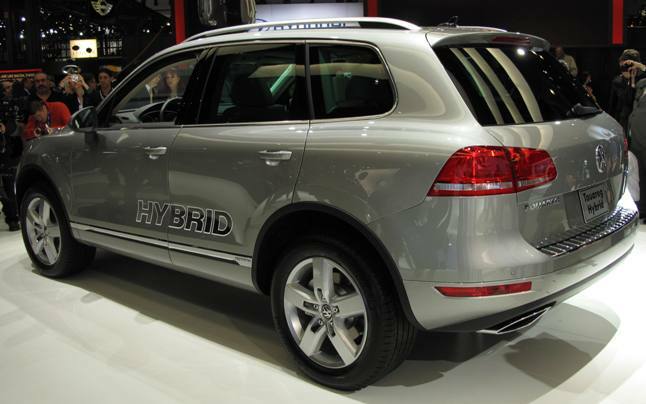 The Touareg will hit showrooms at end of year with the gas & diesel engines with the hybrid (pictured above) to follow. The Porsche Cayenne has four models starting at $46,700 for the 300 horsepower V6, $63,700 for the 400 horsepower Cayenne S, $67,700 for the 380 horsepower S Hybrid and $104,800 for the 500 horsepower Cayenne Turbo. The Hybrid model combines a 333 horsepower supercharged gas engine with a 47 horsepower electric motor. The Cayenne has adjustable sliding back seats, more cargo space and an interior that has taken its cue from the four-door Panamera sedan. The S and Turbo models hit showrooms on July 10 and the Hybrid and V6 come out in the Fall. The all new MINI Countryman with a MINI-first four-wheel-drive system debuted during the New York International Auto Show. 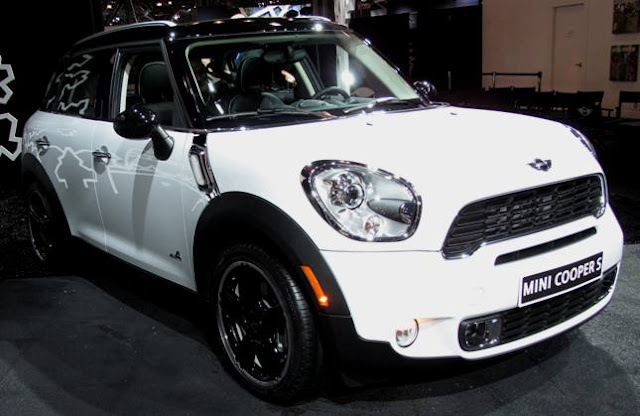 Measuring 161.3 inches long and with a wheelbase of 102.2 inches, nearly six inches compared to the hardtop, the MINI Countryman offers more passenger space than any other MINI, along with nearly 40 cubic feet of cargo space. In addition to the circular instrumentation on the dash, a key feature is the Center Rail aluminum track that stretches from the front to the rear of the cabin for storage of personal items, electrical and USB connections for integration of smartphones and other devices. MINI Countryman powertrain options include Cooper, Cooper S or Cooper S with ALL4. The Countryman will be the first crossover on the market to feature a turbocharged and direct-injected engine with VALVETRONIC technology for optimum performance and efficiency. Its a MINI on steroids that will go on sale in early 2011. 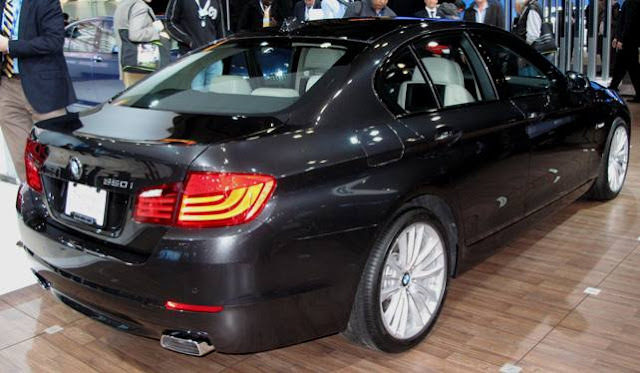 BMW's North American debuts at the New York International Auto Show were the all-new 5 Series, the 335is Coupe and Convertible and BMW X5 SAV while the BMW Alpina B7 xDrive made its World debut. All will be 2011 models. 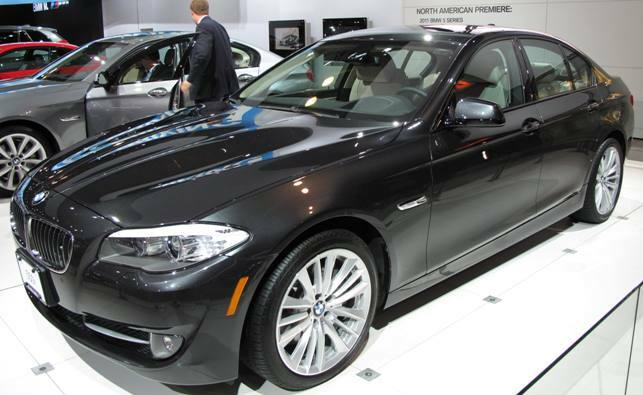 The new 5 series was most impressive and one of the highlights of the show. The two new BMW 5 Series Sedans which arrives on June 19th are the new 535i Sedan, powered by a 300 horsepower 3.0-liter twin-scroll turbocharged inline engine, starting at $50,475, and the 550i with the 400 horsepower reverse-flow 4.4-liter Twin Power turbo V8 starting at $60,575 (including $875 Destination & Handling). Both will feature the new 8-speed automatic transmission. BMW says a 528i model will arrive later. The driver assistance systems offered with the new 5 Series include an all-new Parking Assistant, Top View cameras, and Frontal Collision Warning with application of the brakes when ordered with Active Cruise Control plus Stop & Go. Other driver assistance features available include Blind Spot Warning, Lane Departure Warning, a Head-Up Display, BMW Night Vision with Pedestrian Detection. Also, this spring the BMW X5 will have new powertrains and updated design for 2011. Two of the X5’s powertrains will be all-new for 2011, creating the new X5 xDrive50i and X5 xDrive35i, in addition to the familiar BMW Advanced Diesel X5 xDrive35d. The gasoline models receive BMW’s new 8-speed automatic transmission for better acceleration and fuel efficiency. Enhancements to the 2011 3 Series Coupe and Convertible include style updates for 328i and 335i models and a new engine for 335i models. The 2011 3 Series Coupe and Convertible models will go on sale this Spring. All BMW vehicles come with the BMW Ultimate Service, $0 maintenance for the first 4 years or 50,000 miles, is included. The New York Auto Show media days debuted an impressive line of vehicles from a variety of manufacturers but it was the Koreans that ran away with the most stunning introductions, specifically Kia. Kia showed the all-new 2011 Sportage crossover, the all-new 2011 Optima sedan, an upscale verion of the all-new Sorento called the "Sorento SX". Adding to the Korean frenzy Hyundai detailed all the bells and whistles, including massage seats, for its new $50,000-plus Equus. 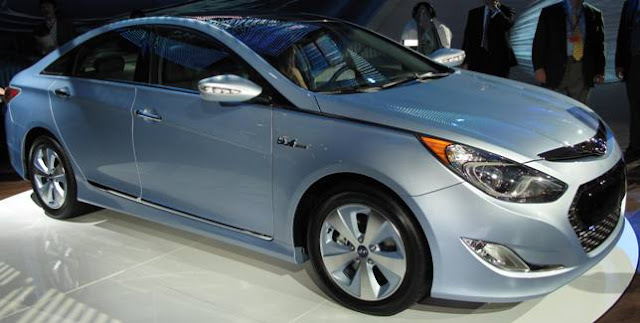 Hyundai also showed hybrid and turbo powered versions of the Sonata which was the top introduction at the 2009 Los Angeles Auto Show. The biggest surprise, was the Forte five-door hatchback which will appeal to Mazda3 buyers. All, with maybe the exception of the Sorento SX have the potential to be high volume sellers. More deatils from the New York Auto Show will follow - stay tuned. Toyota Motor Sales reported March sales of 186,863 units, an increase of 40.7 percent for the month, compared to the same period last year. General Motors' core brands, Chevrolet, Buick, GMC and Cadillac, had sales of 185,406, a gain of 43 percent over a year ago March. Ford, Lincoln and Mercury March sales totaled 178,546, up 43 percent versus year ago. First quarter sales totaled 428,596, up 37 percent. American Honda Motor posted March sales of 108,262 vehicles, an increase of 17.8 percent bringing the year-to-date sales to 256,412, an increase of 12.5 percent. Nissan North America reported March 2010 sales of 95,468 units, an increase of 43.3 percent, compared with March 2009. Chrysler Group reported total U.S. sales for March of 92,623 units, a decrease of 8 percent compared with March 2009. Hyundai Motor America reported March sales of 47,002 vehicles, up 15.4 percent versus one year ago, and for the quarter, Hyundai sold 111,509 vehicles, outpacing the previous record first quarter of 2006. Kia Motors America reported its all-time best March sales of 30,522, a 23.5-percent increase over the same period last year. Year-to-date sales are up 11.3-percent for a record best first quarter ever. Subaru of America had another monthly sales record with 23,785 units sold in March making its best first quarter sales ever with 57,494 units sold. The BMW Group in the U.S. (BMW and MINI combined) reported March sales of 21,670 vehicles, an increase of 2.6 percent from the same month of 2009. For the first quarter, the BMW Group also reported a total sales volume of 55,051 vehicles, up 7.4 percent compared to the first three months of last year. Daimler reported U.S. sales of 20,700 Mercedes-Benz and smart vehicles. Mercedes-Benz USA reported March sales of 20,023 vehicles, up 28.3%, propelling the company to a 25.7% increase for the first quarter. Mazda North American Operations reported March 2010 sales of 23,193, an increase of 5.5 percent versus March 2009. Mitsubishi Motors North America had March 2010 sales of 5,434, a 17.6 percent increase over March 2009, and its highest monthly sales total since August. American Suzuki reported sales of 2,246, a 72 percent tumble from March 2009 and year-to-date sales are 5,661, a 63 percent drop from 2009.